My daughters remind me how many days are left until Christmas on a very regular basis. Sometimes they tell me more than once in a day! It seems like there are last minute gifts and things on the "to do" list that pop up every time I cross one off my list. Are you looking for a festive and easy last minute gift? I was planning to make a batch of some of my cranberry popcorn to put in little goodie bags when I found these pink and green goodies. Now I'm completely inspired to make some fantastic gifts! Here's what I would normally do...5. Place the popcorn on a lined baking sheet and bake for 10 minutes at 300 degrees. Here's what I'm going to do...5. Shape the covered popcorn into balls, using a little butter on my hands to prevent sticking. 6. Place a craft stick in the popcorn ball. 7. Wrap in a cellophane bag and tie a ribbon to close it. Do you have a quick and easy holiday recipe to share? I'd love to hear about it. Please share! Oooh you should try it.. I'm not sure what it's called, but it's similar. 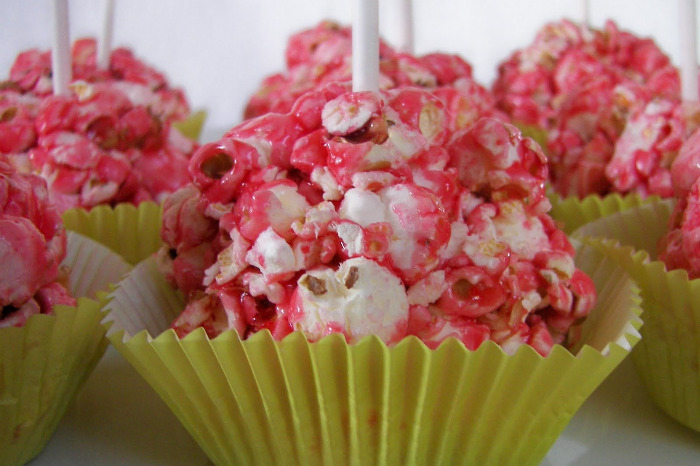 Instead of cranberry you melt those little redhot candies and put it over the popcorn. AMAZING!